Random Act of Christmas Kindness: Candy Cane Bomb a Parking Lot! 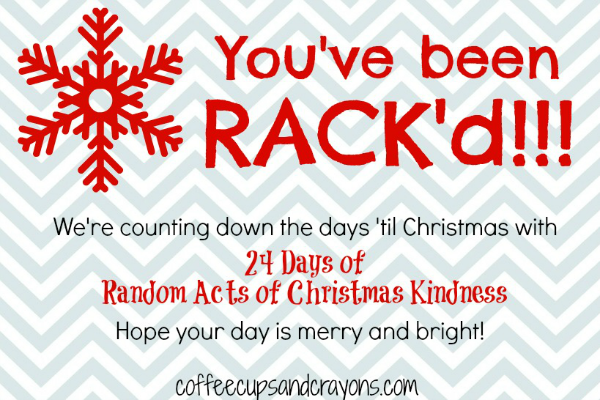 We have been having so much fun with our 24 Days of Random Acts of Christmas Kindness! Last year our last act was candy cane bombing a parking lot and it was so much fun we couldn’t wait to do it again this year. What does candy cane bombing a parking lot mean? It’s simple! We just go around sticking candy canes and a note on car windshields for people to discover. Here it is if you want to use it too! Just right click on the image, save it to your computer, and print out. I print it on 4×6 photo paper to save myself some time. You may link to the card if you want, but please don’t upload it onto your blog or website without permission. Thanks! We tape candy canes to the corners of the cards before we hand them out so everyone knows what we are doing. It’s a good time to sneak in some fine motor and counting practice too! Then comes the fun part–candy cane bombing! We chose to spread kindness in our school parking lots where the teachers park. We thought they deserved a little extra kindness–especially this time of year! Want to spread even more kindness? 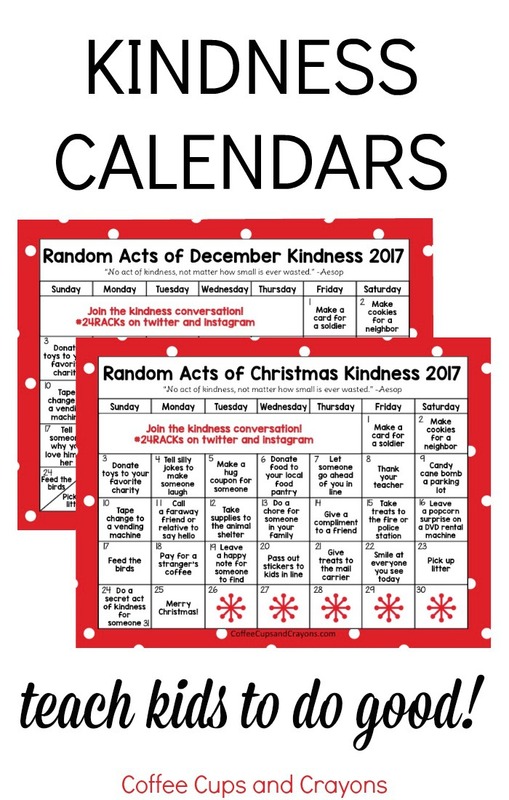 Print out our free printable Random Acts of Kindness Christmas calendar! A fun idea, and simple to do with young kids! Love that you used them to spread some smiles at the school. Sharing this! Sheila it was so much FUN! Thank you for sharing!!! This is a really cute idea! I hope everyone enjoyed their candy canes! We heard they were a huge hit!!! Thank you Ashley! Hi Megan! I absolutely LOVE this idea! And I love the phrase you coined: candy cane bombing a parking lot! So fun and clever 🙂 Thanks for making the world a sweeter place! 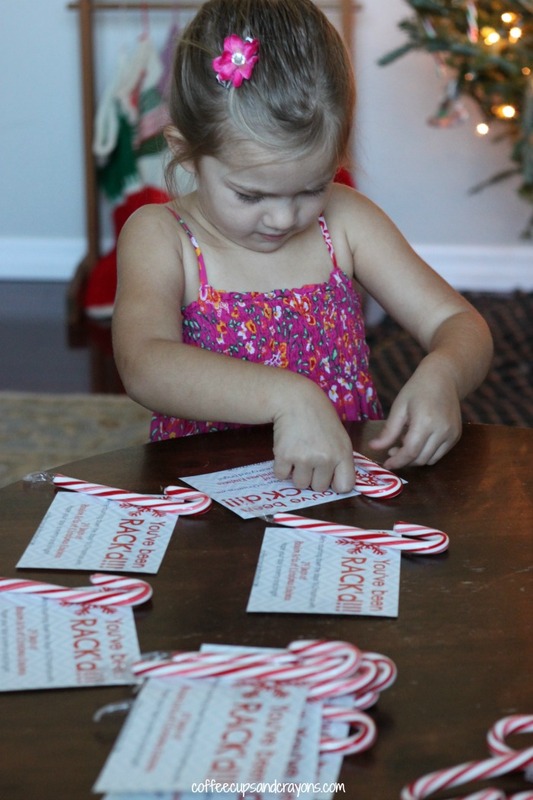 Making the world a sweeter place with candy canes…I need to add that line to the post!!! As always thank you so much Katherine! This is so cute! We are so doing this today…watch out Target parking lot! Wishing you and the family a wonderful Christmas and as always…we love all your ideas! How fun!!! I can’t wait to hear about it!!! I am always looking for things to do with my little sister through Big Brothers Big Sisters. this will defiantly be one. Great idea!!! Have so much fun!!! Sounds like fun and I am sure it would be. But how many people in a parking lot do you think actually ate the candy cane? Not knowing if it was laced with something. It is a sad thing that this world is like that…but it is. If a candy cane…or any other thing..popcorn bag….was left on my car in the trash it would go. We did it in the teacher parking lot where we know all the teachers so it wasn’t really an issue for us, but that is a very good point! Oh Amy I’m so happy that someone candy cane bombed you! So sweet!!!!!! My 7 yr old grandson and I did this last year, except he just handed the candy canes out to shoppers. The look on his face was priceless! And to see the kids’ faces light up and the adults’ expressions turn from harried and stressed to a smile was sweet, too. Can’t wait to do it again! How sweet!!!! I love that! What do you mean by “BOMB: a Parking Lot ????? I was the recipient of one of these! It was taped to the vending machine at work along with 4 quarters! It’s really made my day! Just these small acts of kindness go a long way! Thank you for spreading this joy! I was feeling dark and gloomy when I pulled my car into a parking lot of my local community center. I had just remarked to a friend that I think I just don’t like people very much and they don’t like me. Several hours later, I returned to my car to head home and there it was! I had been RACK’d! I read the card and felt like some kind of miracle had just occurred. This candy-cane random act of kindness reminded me there are people in the world that do make it a better place. I felt hugely relieved and grateful that this random act occurred at just the right moment for me. Thank you, mystery person. YAY!!!!! I’m so glad you got RACK’d! Hi Megan, I love this idea! Such a nice thought! Unfortunetly I missed it for Christmas, but I was thinking about trying it for Valentines Day or another month coming. Have any suggestions? I will keep you posted if we end up trying it with my Girl Scout Troop! Thanks again! What if they just made and stuck valentines on cars? That would be a fun surprise!!! 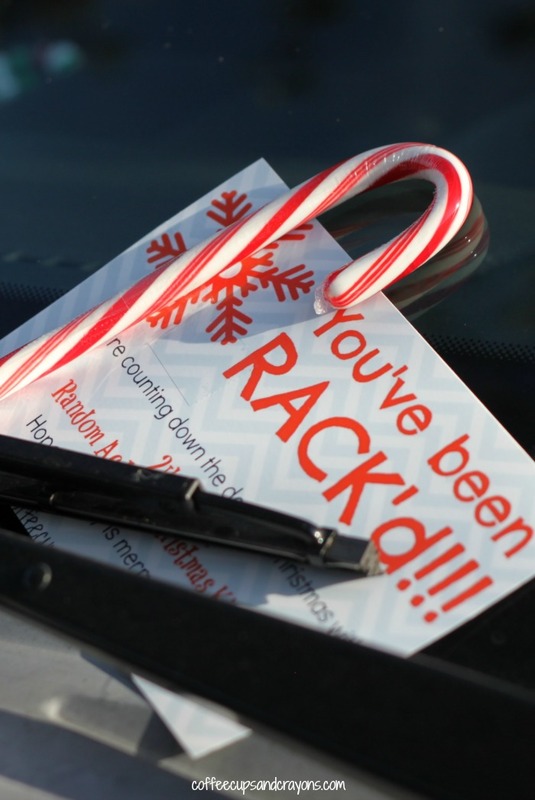 I didn’t read through all of the posts, but thought since it snows here, we would put the RACK card and candy cane in a zip-loc baggie first to keep it weatherproofed. I LOVE this awesome idea! And should not be geared to children only…I am using your RACK’d concept and reminding adult Christians I know that there is no time like Advent to do what you can to make the world a better place. I will share with my weekly rosary group as a start. Thank you ! I love this and can’t wait to do with my kids! As a side note – what kind of printer do you use? Mine always have trouble with ‘special paper’ – thanks!! I have a Canon, but we’ve printed at Walgreens too! Hi! I LOVE the font you used for “You’ve been RACK’d!! !” on your cards. Do you mind sharing what it is? Click on the link for the RACK calendar–it has more ideas for you!